Home deep conditioning hair steaming huetiful steamer Heat Damage from the Huetiful Steamer? Heat Damage from the Huetiful Steamer? I watched this video and the Vlogger stated that moisture based conditioners do not work well on her hair when she uses the Huetiful Steamer, however, she likes using the steamer with oil based product. She even stated that she had heat damage from using the steamer when she used moisture based products. Before watching this video, I had heard great reviews about the steamer. I, myself have had a great experience using the steamer. I got interested in the Vlogger's experience when she mentioned that oil steaming does great for her hair. On the Behuetiful Website, the conditioner recommended to be used with the steamer is oil based. I don't use the masque from their website but I always add olive and coconut oil to my conditioners for steaming. Perhaps, that's why I get great results from the steamer. I am planning to try the oil steaming and will come back and share my results. Maybe Oil is the effective factor with the steamer use. But then everyone's hair is different. What about you? 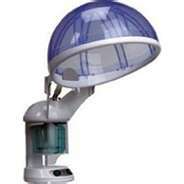 If you own the steamer, did you get great results with oil based or moisture based products? Have you tried oil steaming? Thanks for stopping by Zainab. Please do share your results when you steam with oil. I am really curious about the oil steaming. Ive had my steamer for a few months but just finally used it. I enjoyed it very much. I used an oil based DC (most DCs are oil based) and my results were lovely. Thanks for stopping by Jenelle. I am glad that your steamer works for you. Actually, most DCs are not oil based. Oil based means the first ingredient is oil. Most DCs are water based and that's why a lot of people add oils to their deep conditioners to give it an oil boost! Hello. I have been using the steamer almost for 3 months now and I noticed a difference when using an oil based vs. water based DC. Originally, I started with a oil based DC 50/50 (olive oil and coconut oil)and loved the results. Then for the last two DC treatments, I decided to use switch to KBB Luscious Locks Moisturizing Hair Mask because I was looking for a more solidified formula. However, unknownly understanding the importance of the DC base for my hair type (4b). My hair was very much drier than my prior DC treatments. So now it all makes sense. I will most definitely stick to oil base DC rather water. I am guessing the oil based works better for you. Did you use the steamer as well? Some people's hair do very with oil. Mine does tremendously. It took me ages to figure that out.